Question: What do you know about the history of drinking water treatment? WBH response: The history of drinking water treatment has been a long one, and clean water has sustained our planet almost single-handedly for millions of years. Plants, animals, and humans receive energy and sustenance from this basic source. Without water, there would be no life. And without clean drinking water, many people do suffer and die, even to this day. 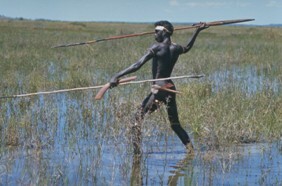 Hunters and gatherers would drink the fresh water from lakes, springs and rivers as they were hunting their prey. When they would settle in and set up camp, following the herds, they would usually have one main source of water they would use for all their needs such as drinking, cooking, cleaning, and waste removal. Because the drinking water was used in so many different ways and was often a part of the waste removal, or very close to it, the people would often be sick with dysentery, e-coli and other waterborne illnesses. They did not know where their illness was coming from--the concept of germs and other harmful contaminants in water did not come into awareness until the late seventeenth century. So, they kept drinking the water, blaming the sickness on a bad wind or an evil spirit. With the birth of farming and domestication of animals, people started to congregate and live in tighter quarters, fueling the need for cleaner drinking water. People began to see the correlation between drinking fetid water and sickness. The first written account from Greek and Sanskrit texts concerning the treatment of drinking water dates back to as early as 4000 B.C. People at this time were aware that boiling water did help to purify it and that filtering it through charcoal, straining it, and exposing it to sunlight would also treat it. In Mesopotamia, a law stated that wells had to be separated from tanneries, cemeteries, and slaughterhouses by 75 feet minimum. They still had no idea about microbes or pathogens but did recognize a correlation between dirty water and illnesses. The Romans built giant aqueducts, supplying Rome and surrounding cities with fresh water. Nine massive aqueducts sent fresh water across the country of Italy. The water used in Ancient Rome was poor by our standards but would be the cleanest water used until the 1800s. Most of the citizens drank more wine than water. The process of fermentation killed many of the pathogens contained in the water used to make the wine. In the ancient world, the people who were healthy drank wine and beer, while the poor people drank the water. After the collapse of the Roman Empire, people reverted back on their knowledge and prior history of drinking water. Disease ran rampant. The people did not take care to protect their water. The same water would be used for drinking as for disposing waste. Illnesses during this time were considered more a sign of sinfulness, not poor water. The next several hundred years would be a time of superstition and sickness, with little regard for water treatment. With the rebirth of civilization and industry, people throughout the world began to become more aware of the importance of clean drinking water. In the late 1880s, Louis Pasteur proved his germ theory and showed how microbes in water could transmit disease. With widespread use of the microscope, more scientists began to identify harmful bacteria in water and understand how these bacteria were being spread and what type of illnesses they were causing. Government agencies began to see water treatment as their moral responsibility and the health of the people became more important. Water treatment plants were established to purify the water and weed out the contaminants. Water was softened, filtering out the heavy metals such as cadmium and iron. Finally, in the U.S. in 1974, Congress passed the Safe Drinking Water Act, making sure its citizens would have relatively clean water and be entitled to the same healthy water as their neighbors. Giant steps have been taken to ensure people’s health with clean drinking water, but much more needs to be done, especially in Third-World and less-developed countries.